What I liked about Molly’s book is that she talks about her thinking process. 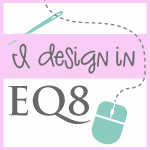 She has a section on how to sketch your FMQ idea’s and how to practice FMQ designs on paper. Which helps with a smoother flow when you actually sit down to quilt. Good advice I say, planning is always key to any given project. These are two patchworked pieces I have prepared ready for quilting. I am thinking that I will turn them into Pot Holders which will be useful for me. I was thinking of trying out some of the designs from Molly’s book. I will document my progress as I go along.